Col. Joseph L. Ryan, played by Frank Sinatra (From Here to Eternity and The Manchurian Candidate), is an American POW in Italy during World War II. Ryan is imprisoned with a group of British soldiers who nickname him “Von Ryan” because his command decisions inadvertently help the Nazis. “Von Ryan” tries to redeem himself by plotting a daring escape across the Swiss Alps. Very interesting actioner feels like a cousin of David Lean’s war epic The Bridge on the River Kwai (1957). If Lean’s movie emphasized British’s stiff-upper-lip wrongheadedness, Von Ryan’s Express latches onto American naiveté. It’s surprising to see a Hollywood war movie where the Britons are portrayed as far better soldiers than the Americans. Ryan’s ill-conceived choices result in the death of many soldiers, a curious thing that really adds an unexpected dimension to the movie. Swiftly directed by Mark Robson (Peyton Place and The Inn of the Sixth Happiness) from a screenplay by Wendell Mayes (Anatomy of a Murder) and Joseph Landon (Finian’s Rainbow) based on David Westheimer’s book, Von Ryan’s Express has great pace — I particularly found the film’s climax very exciting. Most of the visual and sound effects don’t show their age — the miniatures and matte work are well-integrated into the narrative — and you always feel fully engaged. Sinatra is a bit too laid back — perhaps done on purpose in order to accentuate the character’s inefficiency — but Trevor Howard (Ryan’s Daughter), who plays a British officer, is forceful and charismatic. The supporting characters could have benefited from more exposition, but this is an action movie so not fleshing out minor characters is not a huge problem. Aldofo Celi (Thunderball) plays a cowardly fascist. Fans of TV’s Knight Rider will enjoy seeing the late Edward Mulhare as a chaplain. Jerry Goldsmith’s (Planet of the Apes and Star Trek: The Motion Picture) music score reinforces the film’s many exciting sequences. Nicely shot by veteran cameraman William Daniels (Grand Hotel and Dinner at Eight). Walter Rossi’s (The Robe and The Enemy Below) sound effects were nominated for an Oscar. This 20th Century Fox super-production has some fantastic action set-pieces, but the thrills aren’t operating in a vacuum — the insane nature of the combat experience is an essential element of the narrative. 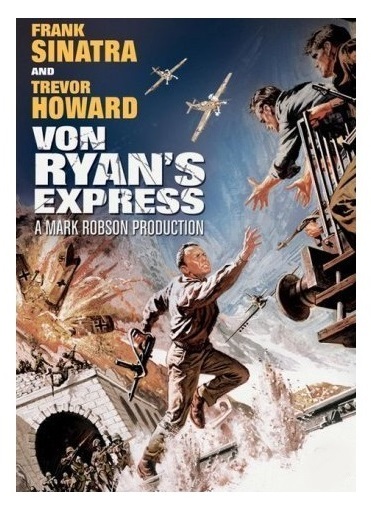 Von Ryan’s Express is an action-packed war movie with a brain. Color, 117 minutes, Not Rated. This sounds entertaining! Nice review.